« Can you de-complicate personal finance? It’s all about the timing… Or is it? In August, my beautiful new wife and I eloped to Paris to have a combo wedding and honeymoon. It was just the two of us, so we didn’t have to worry about what colour the napkins should be. We also didn’t have to worry that mad uncle Eric would drink too much and try join the band, or that someone would knock over the ridiculously ostentatious wedding cake. I was also fairly confident that I wouldn’t end up in a runaway bride skit, because I’m not Richard Gere! Nope, we skipped all that, had a special time for the two of us and got some amazing photographs like the one below. As a bonus, we saved what is most likely a large fortune compared to what the average wedding can cost in this day and age. Funny how everyone else you speak to says they want a simple wedding, before they end up spending somewhere in the region of R200k! The US average at the moment is an even more ridiculous $29k, that’s R400 000 for a 1 day party, I’d rather buy half a townhouse! Instead of that, we spent 2 weeks in France. There was a dinner on the Eiffel tower the night before our wedding, then the next day a private ceremony in the gardens of Versailles, followed by photo tour of Paris in a cute old Citroen 2CV. It was awesome! We spent a few more days wandering around the streets of Paris, some time on the beaches on the banks of the Seine the mayor created for those poor folk who couldn’t escape to the Med (including sparkling water drinking fountains, vive la France! ), and as you have to do when you’re in Paris, a day in Euro Disney. Disneyland is an interesting place. I’ll leave the costs out of it, because if you’re a family with a couple of kids the numbers are quite scary. We were a family of two adults, of sometimes questionable maturity. Unfortunately it was a beautiful day. Even more unfortunately it was a Saturday, and most unfortunately it was during the school holidays. Don’t go to Disney on a beautiful day, or a Saturday and especially not during school holidays. If you do go on those occasions all you’re going to experience is an hour and a half of queuing followed by a minute and a half of high pitched shrieking. My wife was rather upset and told me to try keep quiet, but thanks to the seat design which included a massive protrusion in the crotch area, this just wasn’t going to happen. I was not a happy rider! My wife on the other hand loves roller coasters, can’t figure out why. That slow climb, followed by plenty of vigorous movement, all while being tightly restrained. Oh, right. So roller coasters, jolly exciting, and people will queue for hours just to ride one for a 90 seconds. And that brings us back to the markets. They also go up and down, and can be jolly exciting, but we keep looking at them the wrong way. Well most of us at least. We get super excited when the market is at all time highs, and moan a lot when things take a dive. Funny thing is, the majority of us around here are still working, and still investing, and so we need to look at market prices in a whole different way. 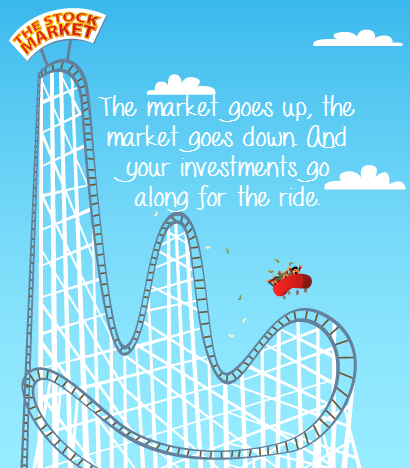 The way I see it, markets go up and markets go down. We tend to get very excited watching them go up, and then very anxious watching them go down. But for most of us, that’s exactly the opposite of the way we should be thinking. You see, if you’re still earning a salary and investing monthly into a fund or index then the dips should actually be seen as positive, as we saw in the article about free cheese. Think of it as the next time you buy you’re getting a discount. In the same vein, you should also get really upset if the shares go up, as you’re paying more for the same thing. It should bother you as much as electricity price increases, or the annual DSTV increase. When was the last time you celebrated the fuel price increase? Never? But why not, the fuel in your tank is now worth more, so it’s just made you wealthier. Of course we can all see that is ridiculous, and now I’m saying we should think about the markets in the same way. This all flips back the other way round once you retire, because then you want to switch from being a buyer to a seller. So don’t be too concerned that the global markets are around 10% lower than their peak. Don’t worry that they’ll possibly go down a little or even a lot more. Just keep using all your spare cash to accumulate shares at a discount. If you’re after dividends, you’ll also be getting a bigger yield than you otherwise would. But even for growth investors, continuing to buy on the way down and up the other side of a bear market is a fantastic way to make great returns in the long term. Currently the market is quite volatile, but in my opinion this largely due to 2 entities financial press and economists. So many articles are written warning of a dooms day which is eminent, and the economists who should be reading tea leaves rather than trying their hand at projections. Then on the other side of the coin you have the statisticians who also like to colour their predictions. So who do you listen to – well hopefully all of them, but just don’t be led by them or heed too much what they are saying after all they are doing this as a job whereas as for us who invest in the market to gain in capital growth and get the benefit of dividends over the years. I have been investing in the JSE since 1968 and have been through pretty much every major downturn that has occurred on the JSE and still today it is an appropriate market to invest in. I believe there are too many retail investors who think of the JSE as a roulette wheel, it isn’t in fact it is far more even handed than the roulette wheel. That last paragraph specifically says it incredibly well. But as someone who’s always curious about the numbers, I thought I’d see if I could get some clarity on what would happen if you bought at a really bad time, as opposed to someone who bought at a really good time. On Monday the 24th of August 2015 the markets dropped by nearly 10%. If you followed even the non-financial media you’d swear the world was about to end. But that Monday had nothing on Monday the 19th of October 1987. It’s called Black Monday. On that one day, the Dow Jones index dropped by a massive 22.5%. It was the biggest one day drop in stock market history. For many it did feel like the end of the world. Now what would have happened to you if you’d put your life savings on the stock market on Friday the 16th? How different would you have been compared to someone who had a crystal ball and only put his money to work on Tuesday the 20th? Yes but more arabs ride camels than any other quadriped. Unfortunately, it’s rather difficult finding share price growth with dividends reinvested for the JSE going back to 1987. So we’ll assume you went for a dual listed share, British American Tobacco. 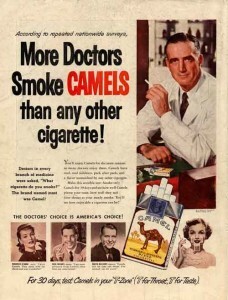 It was the 80s after all, a heyday for smoking. British American was one of the largest stocks around, so in this hypothetical case, you put all your life savings, $100 000 onto that one share, with the aim to retire today. How much of a difference would it make if you did that on the day before Black Monday, or the day after? Well thankfully, LongRunData.com has that answer for us. If you’d had a crystal ball, and could anticipate this massive crash, and therefore only invested the day after Black Monday, your $100 000 would now be worth $5,077,056.47 thanks to compound interest with dividends re-invested. It really will be a great retirement indeed! Now how about the poor fool who trusted Paul the Octopus, and put his $100 000 into the same share, but on possibly the worst day in history to invest a lump sum, the day before Black Monday, the 16th October 1987? That poor guy who had to watch 22.5% of his life savings vanish the very next working day. Well hopefully he didn’t sell that day, because today he would be worth $4,240,834.80. Sure it’s about 16.5% less than $5 mil, but do you think you’ll have any less fun in retirement with $4.24 million than you would with $5 million. Oh no, I can only have a 5 bedroom house in Clifton and not a 6 bedroom house. My Rolls won’t be the extra length version, and my young gold digger wife will only have 34C’s instead of 36D’s. All of that is of course pure nonsense. You wouldn’t notice the difference at all. The only person who would be upset is the one who sold when the stocks were down. It really does go to show, that timing is for all practical purposes irrelevant. The unknown person who said that famous quote was spot on: It’s time in the market, not timing the market. Are you scared of market dips? No, I love opportunities to get a discount. No, I focus on dividends, so it doesn't really matter to me. Yes, I hate seeing my net worth go down. Yes, I'm retired, so I can't afford to lose money if I sell. I'm not an investor, I just came here to see your wedding photo.